A daredevil actor known for dangerous antics—onscreen and off—holds a whopping $5 million policy and Garrison Fidelity isn't taking any chances. 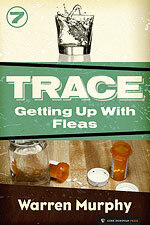 For the first time in his career, Trace is hired to prevent a claim from happening—at twice his usual fee. Gone from gumshoe to guard dog, Trace must endure the antics of the apish actor on set. When a dead body turns up and set pieces start falling down, Trace realizes his double fee comes with a dangerous price of its own.